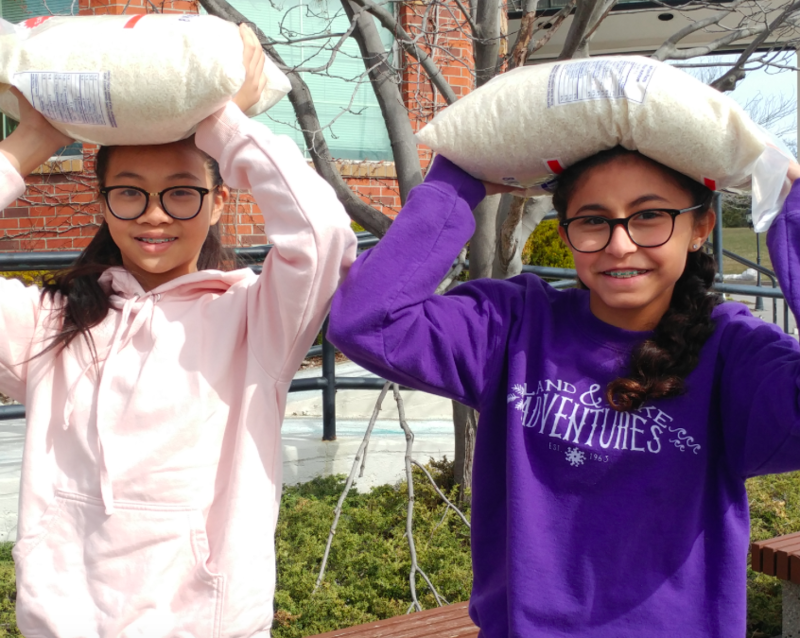 This past sunny Saturday morning we had the pleasure of hosting John Knox Christian School Oakville’s student service team for a service project and learning experience with our WOW Team. The John Knox team consisted of 15 students from grades 6-8, along with some dedicated parents and staff members, lead by grade 2 teacher Mrs. Betty Panza. This year marks the 10th anniversary of the John Knox Christian School Servant Team. The Servant Team was both created and spearheaded by Mrs. Panza in order to offer the students an opportunity to grow in leadership and activate their faith. The team of students, staff, and parents take part in ministry outreach approximately once a month, often after school and on weekends. Other service ministries John Knox has served aside from WOW include Sew on Fire, the Gleaners, Wellspring, and Crossroads Prison Ministry. Students talked and learned about what a day in the life of a student in rural Zambia might look like. One of these activities included participating in a water -rice bag relay. The students also experienced what recess might be like when they played with a soccer ball made of used plastic grocery bags that are made by students in Zambia. The main event of the visit included packing a hockey bag full of MotherCare kits (which include a bar of soap, baby wash cloths, petroleum jelly). The kits will be shipped to Malawi and used by expecting mothers who participate in our MotherCare program which provides access to medical care, prenatal vitamins, and pre-and post-natal medical care to expecting mothers in rural areas. The morning was concluded by an interactive prayer experience where the students prayed for the WOW Team and our mission partners overseas. Make no mistake—these students at John Knox are powerful prayer warriors, and we are so grateful for their visit! The students also participated in a WOW Trivia time. 1)How many people live on less than $1.90 a day? 2) How many children in Africa do not have access to education? 3)What is the child mortality rate in Africa? 5)What is the number of people in sub-Saharian Africa without clean drinking water? John Knox Christian School in Oakville was founded in 1959 by a group of families who attended Clarkson Christian Reformed Church, and began with two classrooms in the basement of their church with 44 students. Today the school has over 350 students from junior kindergarten to grade 8. They are located at 2232 Sheridan Garden Drive, Oakville. If your school or Kids Church program is interested in having an interactive missional learning experience with WOW contact sara@wowmission.com. Extra fun: How to make African grocery bag soccer balls!